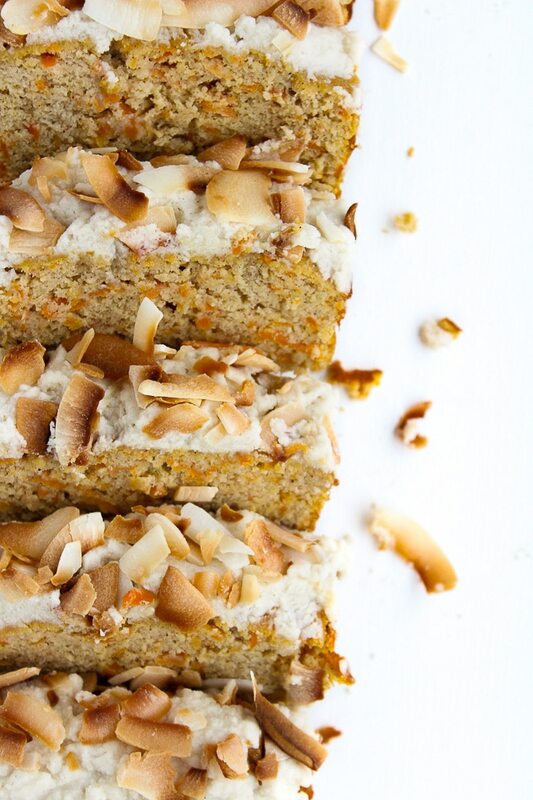 Nut Free Paleo Carrot Cake | A healthier, gluten free and dairy free alternative to carrot cake! What would you call this? Carrot Cake? Carrot Loaf? Carrot Bread? 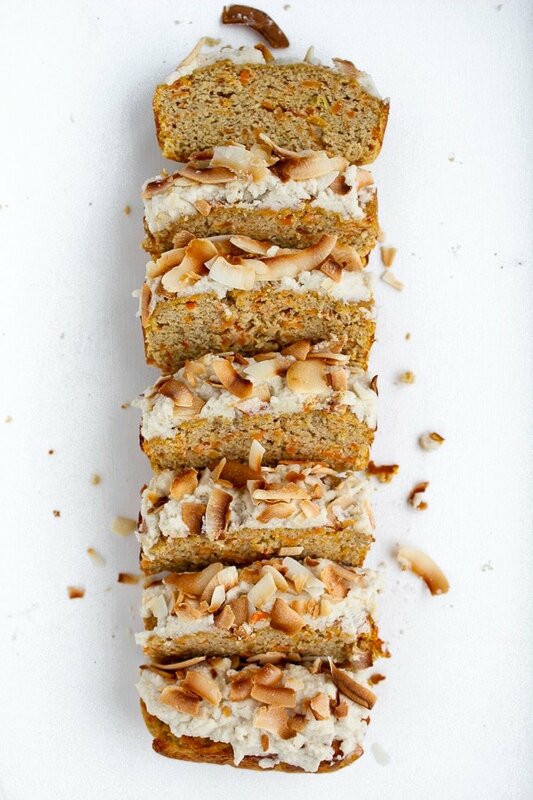 Carrot Cake Loaf Bread? Is that too much? I don’t even know. All I know is that I’ve made this recipe at least five times in the past two weeks and I’m not bored of it yet. Even Mike’s eating it and he’s usually not interested in any dessert that isn’t chocolate. Considering that this is a coconut flour based recipe I’d say that’s even more impressive. Coconut flour and I have a rocky relationship in the past given its finicky nature. If not used properly you just end up with sad, dense, clumpy baked goods that somehow manages to be eggy and dry at the same time. How is that even possible? And based on what I hear from most people experimenting with grain free/nut free paleo baking I’m not alone in that experience. I didn’t even like carrot cake as a kid. I looooved carrots. I loooooved cakes. I hated carrot cake. Raisins? Nuts? Pineapple chunks? Gross. Perfect way to ruin a good thing in my adolescent opinion. While I’ve made my peace with nuts and pineapple, I still think raisins have no business being in or around my face. No thanks. If however you’re not quite as picky discerning as I am when it comes to dried fruit, feel free to add in a handful or two to spruce this up to your own preferences. A handful of pecans would also be good providing you’re not in need of a nut free paleo carrot cake. Instead of the usual cream cheese frosting to top off the cake I decided to go with my tried and true whipped coconut milk frosting instead for a dairy/refined sugar free alternative. So.Much.Better. Make sure to pop a can of coconut milk in the refrigerator overnight so that the coconut cream is easy to scoop out when you need it. I know that whipped coconut frosting can be a tricky thing to get right – the end result mostly relies on the quality of your coconut milk and the stabilizers that were added to it. If you end up with a curdled looking frosting the chances are that it wasn’t your fault. 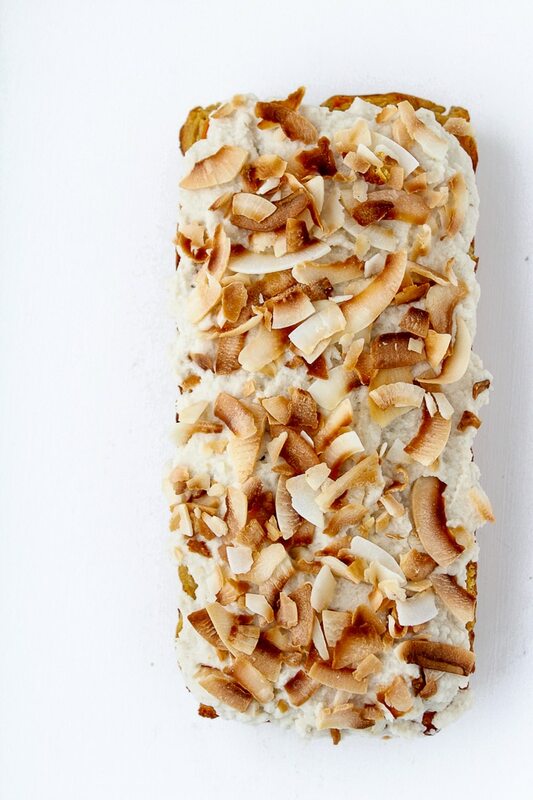 The bright side: it doesn’t even matter because we’re going to top the whole thing off with toasted coconut flakes and it will still taste great! Cool? Now excuse me while I go have a slice of this cake with my morning coffee! Preheat the oven to 350°F/180°C. Line or grease an 9x5 inch loaf tin and set aside for later. In a large bowl mix together the coconut flour, cinnamon, nutmeg, salt, and baking soda. Add the eggs, melted coconut oil, maple syrup or honey, and lemon juice and beat with an electric mixer until smooth. Mix in the grated carrots and fresh ginger until completely combined. Spoon the batter into the greased/lined loaf tin. It will be a thick batter so you may need to smooth the batter down so that it's even on all sides. Bake for 35-40 minutes or until a knife comes out clean when inserted in the center. All the cake to cool completely before frosting. Scoop the coconut cream out of the can leaving behind the liquid* and add it to a medium sized mixing bowl along with the rest of the frosting ingredients. Using an electric handheld mixer beat on high. Whip until smooth. Once the cake has cooled completely frost the cake and sprinkle coconut flakes over the top. *You can save the liquid from the cans to use in smoothies If you frost with the coconut cream frosting make sure to store this cake in the fridge. Thank you for this recipe. It was a little too thick after mixing it up so I added 3 tablespoons of coconut yogurt homemade from coconut milk with another 2 tablespoons of honey and it was really good. So glad you liked it! Thanks Monique! Is it ok to substitute ground ginger for fresh ginger? I want to make the cake today and have ground ginger? Absolutely! You’ll only need about 1/4 teaspoon ground ginger for this – hope you like it! Can this be made with flax instead of eggs? Hi Mallory! 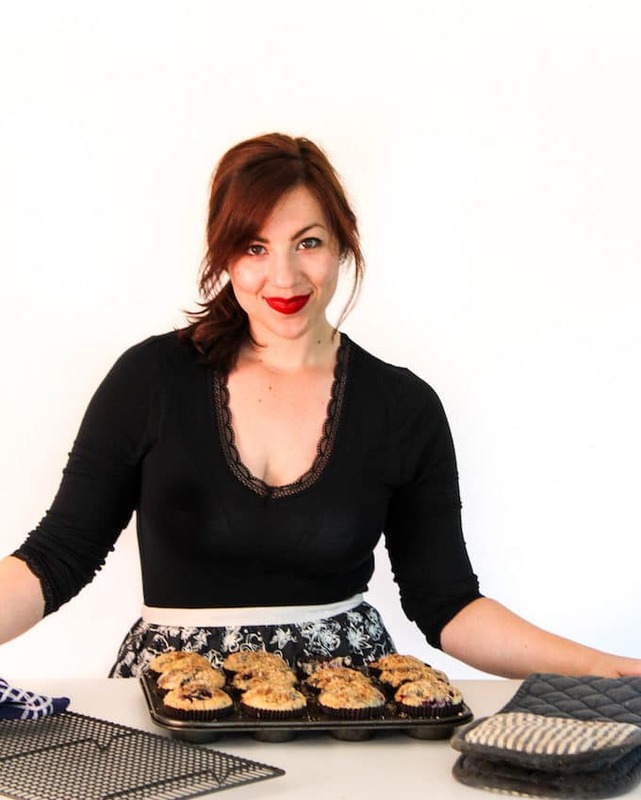 I haven’t tried this with flax eggs yet so I can’t say for sure but I don’t think that they would work here – in the past I haven’t had much success using too many egg substitutes with coconut flour recipes. Wish I could be more hep here! Hi Sarah! I get nauseous when I eat eggs, and am trying to heal leaky gut, SIBO, and other health issues, and I found your page when I was plumb tired of not trying something different after 3 months of low FODMAP! So I tried your recipe with flax instead of eggs, and in fact, tried it twice! It’s wonderful- perhaps a bit more moist and more dense/less fluffy than with eggs, but it is a welcome addition to my recipes with the number of limitations I currently have! I’ve never done a lot of baking, but I’ll be getting our mixer out a little more often! I have not ventured to make your frosting yet, but I hope to soon. It might have worked as well as it did because I let the flax eggs sit for 30-40 minutes before I added them to the other ingredients! Ooh that’s really great to know – thanks so much for coming back to let me know it worked for you! You’ve just given me a good excuse to make this tomorrow and try it out for myself 😀 Thanks Mallory! Hi Farida! Hope you like it! Coconut cream would definitely be alright here and coconut sugar should be ok too! I have desicated coconut with me. I’ve ground it and used it in recipes that require coconut flour but those have had other types of flour as well. So is it a good way to work it or should I purchase pre-ground coconut flour? Hi Sabhya! I don’t have a lot of experience using homemade coconut flour so I’m not completely sure how well it translates. In my experience of using homemade flours there’s always a little bit of a risk that it might not work exactly as planned. However, if you’ve been able to use it successfully in other recipes then I would think it should be alright in this ones as long the weight comes out the same (56 grams for 1/2 cup) because at least then you’d know the density of your ground coconut is at least the same as the coconut flour. I hope that helps! HI there, I have tried the recipe today and by cake didnt rise at all, it tasted saltyand looked very thin even though I followed the recipe card down to a T. Do you think I did something wrong? Hi Victoria! So sorry the cake didn’t turn out well for you! Without actually being there it’s hard to say when things went wrong exactly. I’ve tested this recipe several times and I was tagged on instagram quite a few times leading up to Easter with people tried it and enjoyed it so I’m fairly confident in saying that the recipe works. If you’ve got any specific questions about the recipe I might be able to help more though! I had the same problem! I’m a fairly accomplished baker, and am used to baking with coconut flour, so have no idea what could have gone wrong! I followed the recipe exactly, but the carrot loaf is more like carrot slice – it didn’t rise at all. So odd! The only thing I can think of is maybe I had too much carrot (and therefore too much moisture)? I felt like the instructions about that weren’t detailed enough – is it one packed cup, one very loose cup, one kind of in between cup? I did a packed cup (2 medium carrots), but maybe you meant less? Hi Sarah! You’re totally right – I should have been a bit more descriptive there with the measuring. You don’t need to pack the grated carrots so I guess it would be more of a loose cup. Hi Sarah! Do we need to refregerate the cake after adding the frosting? Yes! I forget that my kitchen is usually freezing and forget to mention that. I’ll make a note of that in the recipe – Thanks Karine! Hope you like it! not always true. I am allergic to hazelnuts, pecans and walnuts, but not to cashews and macadamia nuts or coconut. I love that this is nut-free and refined sugar-free! Definitely going to be trying it. 🙂 Thanks for sharing it at Savoring Saturdays! Just letting you know we’ll all be featuring this as our most popular link tonight at Savoring Saturdays! This is so pretty, and it looks so tasty, too! Im actually really impressed that you managed to create this beautiful cake from solely coconut flour! I am not a fan of mixing flours in paleo baking, and Im all about simplicity ( the less ingredients the better)! 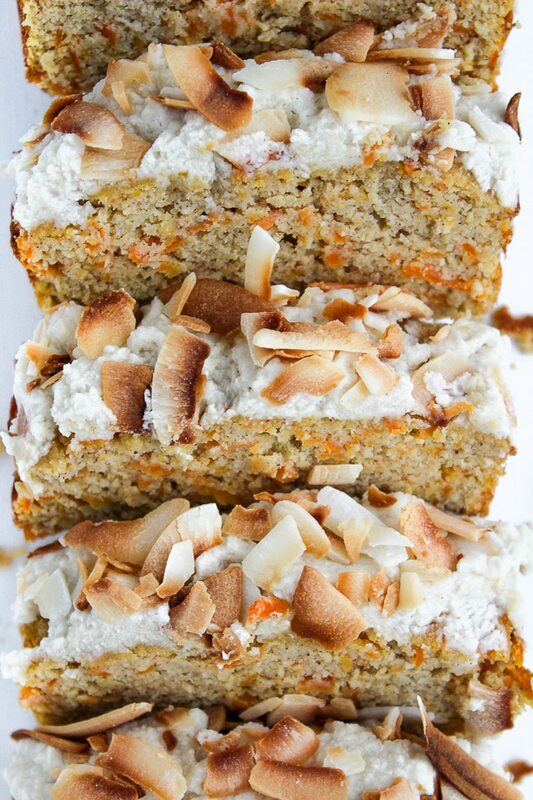 This carrot cake looks incredible! Thanks for sharing! I agree! Whenever a paleo recipe calls for more than two flours I start to get a little weary of trying it out. It’s expensive enough as is to bake grain free without needing too many expensive flours. Simplicity all the way! Thanks Bethany! I’m so happy you mentioned it’s cheaper than almond flour. I had this idea that it was crazy expensive. And I totally see your point about raisins. However, I recently discovered golden raisins. And I love them. I may pop a few in this loaf. PS we had carrot cake as our wedding cake so we Loooooove it but never have it anymore because we are old and our metabolism is old. But yours might bring it back! I’ve cut waaay back on my almond flour baking because I just hate spending so much money on a single bag. I love almond flour, but definitely not the price. I actually almost bought a bag of golden raisins the other week because I thought they looked like they could be good. I’ll take your word for it and try them out – I’ll try anything once! I love that you had carrot cake as your wedding cake! I don’t know why, but the though of carrot cake as a wedding cake is just so cute!